It was a moment not even Del Boy could have passed off with just a cheeky one-liner. 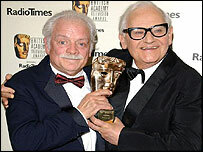 David Jason was visibly moved as he took the applause of his peers during a warm two-minute ovation at the climax of Sunday night's Baftas. 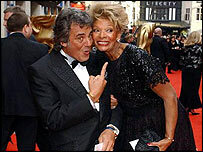 Jason was receiving the Academy 's fellowship - British TV's highest honour - in recognition of his 35 years providing some of the small screen's most memorable comedy moments. He appeared choked as his former sitcom colleague Ronnie Barker paid tribute to him - hailing him as "the governor" - at the end of UK television's biggest night of the year. "The lad from Finchley hasn't done too bad, has he?" said Jason, a former electrician who became one of Britain's best-loved performers as wideboy market trader Derek Trotter in Only Fools and Horses. It was a rousing finale to one of the UK celebrity calendar's most glittering nights, inside the famous showbiz arena of the London Palladium. After the subdued mood of the Oscars three weeks earlier, the British Academy pointedly rolled out a long red carpet in central London to greet some of TV's most glamorous stars. They in turn posed openly for the cameras and the paparazzi, smiling happily and taking in the good wishes of the hundreds of spectators craning for a view. Some of the loudest cheers were saved for stars of the two big soaps, including EastEnders' Kacey Ainsworth, who plays Little Mo, and Coronation Street actor Brian Capron - better known as killer Richard Hillman. Again in contrast to the Oscars, there seemed little attempt to shy away from bold and colourful designer evening wear. Among the most striking were the nation's news presenters - Kirsty Young wore blue, Sophie Raworth pink and Mary Nightingale white. Tamzin Outhwaite showed off a brunette hairstyle swept back from her face. The eyes of the fashionistas, though, seemed largely trained on What Not To Wear hosts Trinny Woodall (black with silver halterneck) and Susannah Constantine (silver, low cut, sequins). It was altogether simpler for the men, however - most of them opting for black tie. The tuxedoed guests included actors Robson Green and Kenneth Branagh, Bargain Hunt host David Dickinson, Coronation Street's Kevin Kennedy and Bill Roache, and Palladium legend Bruce Forsyth. Inside, show presenter Anne Robinson announced she was striking a blow for "girl power" as she arrived on stage arm-in-arm with two handsome male escorts. She said women were now landing top TV jobs, but in a jibe at BBC director general Greg Dyke, she said: "(He) has a fantastic pair of legs and makes a terrific cup of tea." Comedy actor Peter Kay, presenting the best soap award to Coronation Street, sparred with Robinson for some time and dismissed her "warm-up" jokes, declaring: "That's why I'm up first." The victorious Coronation Street cast trooped on stage to receive their third major accolade in a month - and confirm the show's dominance over its Albert Square rival. White-suited Ricky Gervais won one of the biggest cheers of the night for his shortlisting for comedy performance. He was duly announced the winner, and told the audience: "I feel I should use this platform to say something political (pause). Peace...or war, either's good." Bruce Forsyth continued the ad-lib banter with Robinson. "We've never met, have we?" he asked her. "We have, you have just forgotten," she replied in her trademark deadpan. "Maybe I wanted to," said Forsyth, and sneered sideways in that way of his. A heavily bearded Paul Merton managed a dig at his former Have I Got News For You colleague Angus Deayton as he won best entertainment performance. Referring to a saying that the closer to the stage artists sit, the better their chance of winning an award, Merton said: "Angus is in row G - at the Theatre Royal, Drury Lane." Jo Brand, winner of new admirers from her recent stint on Celebrity Fame Academy, said: "I ran the marathon today and managed to get here." Then she added: "Thank you Trinny and Susannah for making me look like an old slapper." The lightness that had characterised the evening gave way briefly to a solemn moment in memory of recently departed actors - among them Leo McKern, Michael Elphick, Pat Coombs, Adam Faith and Dame Thora Hird. However, the tone was brought quickly back on cue by actor Robert Lindsay, who said: "Thank you Bafta for letting us follow the obituaries." Sir Ian McKellen, Julie Walters and David Dickinson provided more of the same before Ronnie Barker received a rapturous welcome as he heaped praise on "my old friend" David Jason.